It is indeed a tiresome task to carry a backpack when you need to carry very few things, say your mobile phone or cash or some ID card and stuff like that. 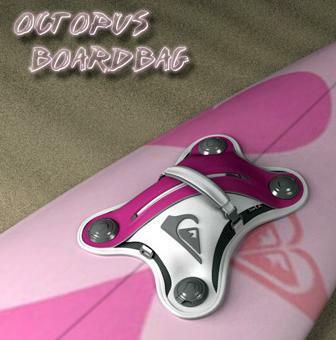 Then the right choice for you to carry is the Octopus BoardBag. As the name suggests especially designed to be attached to any boards you like, when you go surfing. You can place it on your skateboard or surfboards or snowboard and resume your work. It comes with a lever with small Silicone based rubber cupped suctions. Though small these suctions are pretty powerful. You can place it anywhere you get a flat surface. Be it on you vehicle or you desk. Anyone who wants to remove it will have a tough time removing it. It doesn’t scratch the surface where you place, thanks to its Neoprene bottom. You can use the lever to place or remove the 100% watertight bag. It is great even if you go surfing, because it doesn’t sink in water, and instead it floats amazingly. You can choose these board bags from masculine black to most feminine pinks. So, no more of back breaking backpacks, when you can carry this small Octopus BoardBag. Fix it anywhere you wish and you are free from burden! Drum Trike – Music on the move! ← The absolute show off transparent Skeleton Attache!